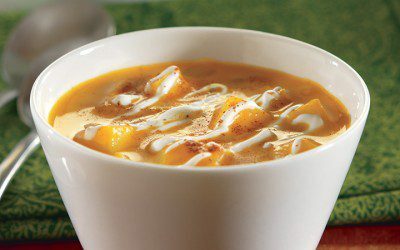 This dish is like pumpkin pie in soup form. Warm, thick, and a big hug on a cold day. You get 5 grams of protein, only 84 calories, and the squash and pumpkin flavors that you crave during the holidays. Heat oil in large saucepan over medium-low heat. Add onion. Cook and stir 3 minutes or until onion is translucent. Do not brown. Add apple, spice, salt, and pepper. Cook and stir 1 minute to coat apples. Add broth. Simmer, uncovered, 8 to 10 minutes or until apples are tender and most stock has evaporated. Add thawed squash and milk to apple mixture. Simmer, uncovered, 6 to 8 minutes or until flavors are blended and soup is hot. Ladle into bowls. Garnish with sour cream and pumpkin pie spice, if desired. Tips: To easily thaw frozen box of squash, place in microwavable container. Cover. Microwave on high 3 minutes. Stir. Microwave 1 minute more if needed to thaw completely. Cook’s note: For added flavor, cook 1 clove garlic, minced, and 1 tablespoon minced, peeled, fresh ginger with the onion. Or add 1/4 to 1/2 teaspoon mild curry powder with the pumpkin pie spice. Exchanges per serving: 1 Bread/Starch, 1/2 Milk.